Move over Friday brunch, we have something more better and cool and it’s called Linner. The concept of linner began in New York as a cross between lunch and dinner, offering the best of both worlds. It was my first time attending a linner and I was super thrilled. Cucina Italian Linner happens every Friday from 3:30pm-7pm at Cucina Italian restaurant in Courtyard by Marriott Green Community. It’s a family friendly linner with three different packages. Courtyard Marriott in Green Community is a beautiful and tranquil retreat with amazing waterfront views. 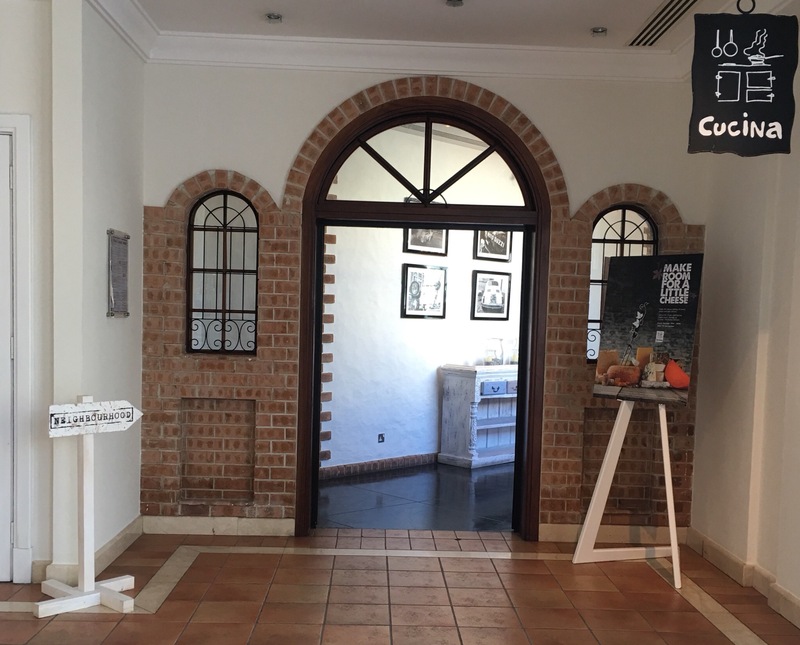 Located in the deep corner of the ground floor is Cucina, Courtyard Marriott’s trattoria-style Italian restaurant. The waterfront facing restaurant is spacious with indoor and outdoor seating area. The simple, rustic and earthy decor of Cucina looks charming. Last Friday when we visited them, the restaurant was filled with families enjoying a relaxed linner. The linner at Cucina offers set menu where everything is served at the table except for the desserts. For desserts, they’ve a separate buffet table. From the set menu, you can order all dishes or your favorites only and also reorder as often as you like. As our welcome drink we were offered a Prosecco based Cocktail. Whichever package you opt for, the drinks are served at your table. They kept refilling our Wine glasses. For those who love their drinks strong, linner serves up a potent cocktail called Limoncello. First to arrive at our table was a range of starters. As we are vegetarians, we tried only the veg starters. 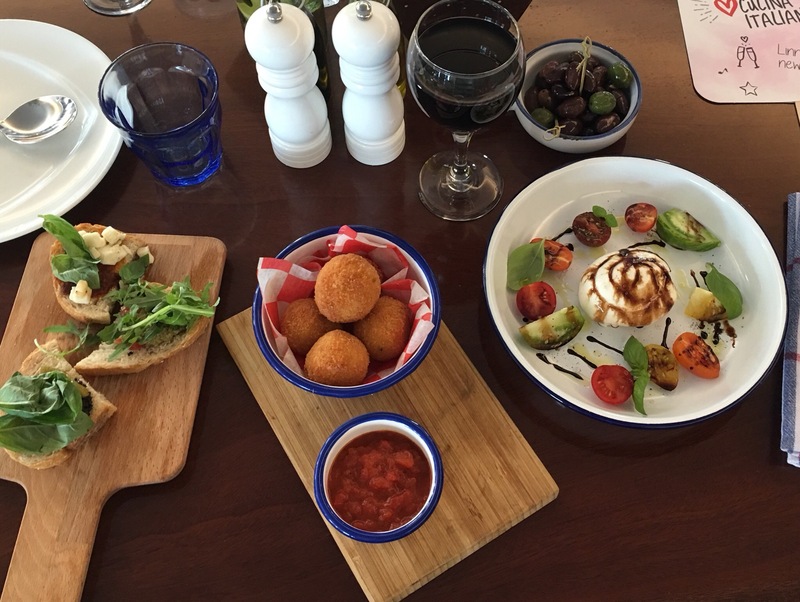 We liked their freshly baked Bread, marinated Olives, Burrata and Arancini with pizzaiola sauce. We loved the fact that Bruschetta was prepared freshly at our table side. We got to try three different varieties of bruschetta. While we were waiting for our second course, my little girl had fun coloring and playing with toys in their play area. With a little help from one of their chefs, she also rolled out her own pizza with toppings of her choice. When our second course arrived, her pizza also arrived fresh from the oven. The second course was pasta and we tried Penne with tomato sauce and Pumpkin Risotto. Both the dishes were deliciously different and flavorful. We liked it so much that we called for second helping. For mains, they had 4 dishes. We tried the Potato Gnocchi, it was the only veg option that was available. Potato Gnocchi was a wholesome dish that had four kinds of cheese and it was rich, creamy and absolutely delicious. The dessert selection was quite good. They had a range of cakes, puddings, pastries and pies. My little girl was happy to see her favorite chocolate fountain. I loved their selection of ice creams and sorbets. Some of the desserts that we liked were tiramisu, Panna Cotta, chocolate brownie, carrot cake and cannoli. We ended the linner with a pot of fragrant and soothing camomile tea. Overall, the Italian linner at Cucina was wonderful. The food, the drinks, the service, the music and the atmosphere was great. We don’t know how more than three hours went by. We really enjoyed our time at Cucina and can’t wait to come back again. 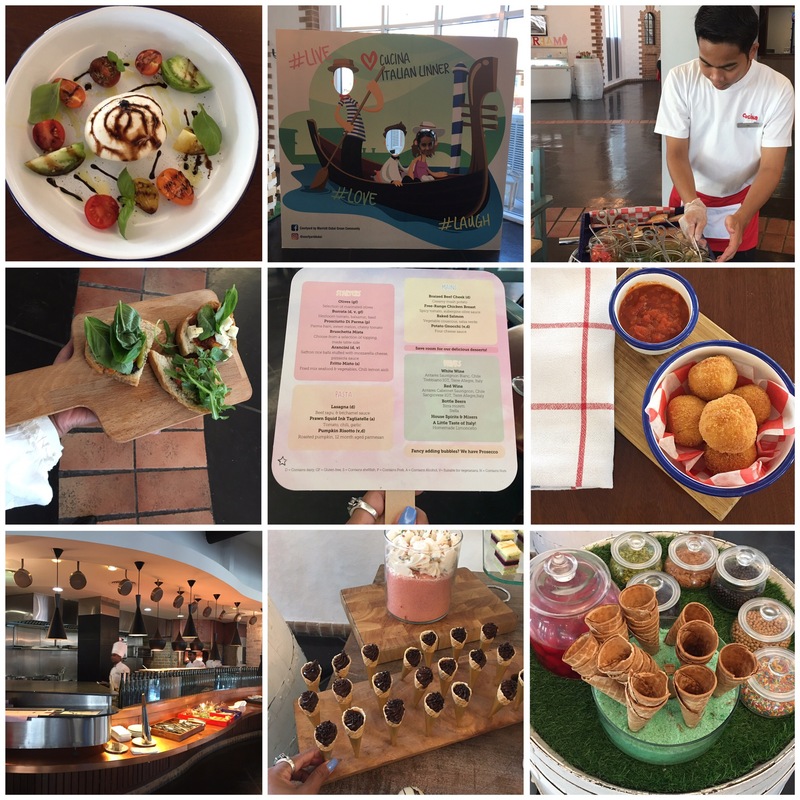 Some of the pictures from the Italian Linner!